Click an excerpt from the list below to read part of the book. You already are creating your own life. Moment by moment, you continually create and attract all the experiences that fill each day, including those experiences which you enjoy, and those which you enjoy less. You attract each person, thing, opportunity and event into your experience. There is nothing in your life which you have not created or invited in some way. In this present Now moment, you are creating your future, and attracting the future you created in very recent Now moments. Everything that is happening around you at this moment is a result of choices you have made in previous moments. Every experience that you have throughout your life is created by, and attracted by, you. At some level, in some way, consciously or otherwise, you have asked for all that you perceive as being external to you. Nothing is random. Nothing occurs without a specific purpose intended for one or more people. There are no mistakes. Planet Earth is the perfect stage and setting for humans to learn about the creative process, and that’s why we come here lifetime after lifetime. Understanding and mastering the creative process is one of the most exciting journeys available here. When you chose to come to Earth for this lifetime, when you were born, you inherited a very special birthright as a human being. Your birthright is that you, as a human being born onto Earth, are a co-creator, perfectly equal to all other human co-creators. Every human on this planet is a co-creator who experiences the results of his or her conscious and sub-conscious choices. This includes all life experiences, events, things, and people we encounter. And since you already are creating your own life, it stands to reason that understanding and becoming involved with that process would allow you to create a life filled with more joyful experiences. Fortunately, you don’t need to learn “how” to become a Creator – you already are. Becoming a Conscious Creator enables you to attract more experiences that you would truly enjoy. Let’s cover a few basics before we begin. What is Conscious Creation? Conscious Creation is knowing that all comes from within. When you truly know and accept that you create and attract all your life experiences, that they emanate from your own desires and feelings, then you are a Conscious Creator. What exactly is it that we create? We create opportunities for experiences designed to pro-duce a specific feeling; these experiences may include people, things and events. Notice that I didn’t say we create money, cars, yachts, mansions, etc. They are incidental – because the experiences we create are based upon the feeling of the experience. Feeling is the key word here. The principles of this creative process are remarkably simple. They are consistent and straightforward. It is we humans who complicate things with overthinking, doubts, worries, and fears. It is we who often choose not what we really want, but what we think we deserve, and we thereby take paths in life which we deem to be less enjoyable. We create our own limitations. The process of peeling back the layers of habits, beliefs, thoughts and behaviors which tend to create and attract less enjoyable experiences can run surprisingly deep, but is a worthwhile process, and certainly a necessary one if you seek a more enjoyable experience in life. 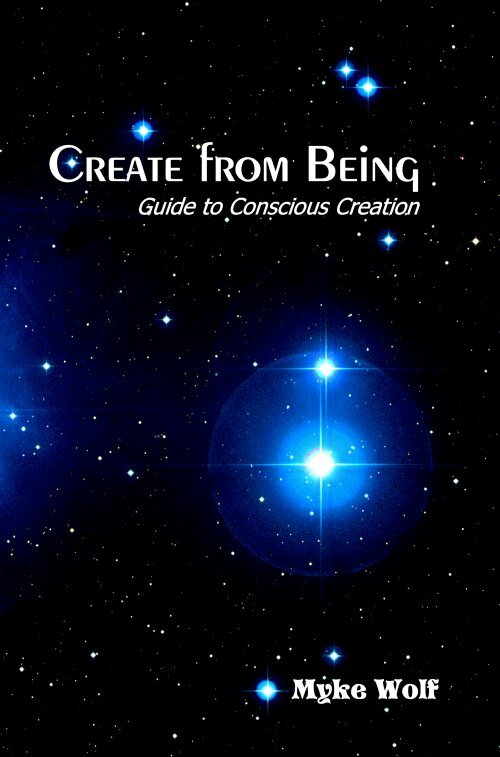 This book will guide you into a more complete conscious awareness of your role as the Creator of your life. It is specifically designed to be read sequentially. The contents are deliberately ordered, and build upon each other as the book progresses. Ultimately, however you choose to integrate these materials into your own life is a matter of your unique choice, and thereby ultimately enriches humanity as a whole. So I fully encourage you to take the pieces that you like and adapt them to your own understanding of your own life as you see fit. I certainly encourage you to experiment with the principles in your own life – that is why I have written this book. And remember, you deserve to enjoy this journey through life – since you ARE creating it all!